In 2011 Max Chandra embarked on a journey of a lifetime. An ambitious 12,000km walk through India. It challenged him physically and emotionally and tested his resolve and passion in showing that one person can make a difference no matter what obstacles they may face. On the 1st November 2011 Max took the first step of his epic walk through each of India’s 29 states to learn of the country that he loves and to service some of the India’s underprivileged people that live from hand to mouth in abject poverty. During his walk Max initiated 6 humanitarian projects in 5 states of India that served over 3,000 individuals. In early 2013 his efforts gianed recognition from 'Real Icons of Change', a lecture series conceived by 'Social Access' and the Times Now TV show, 'Amazing Indians'. After walking 6,186km through 15 states Max’s walk came to an abrupt halt. In September 2013 he was struck by a heart attack thatt has taken him the best part of 18months to recover from . And, having now recovered, he is ready to continue his service to India's underprivilage with his new project - The Waterwheel. This is a waterwheel. Its purpose, as its name suggests, is to be filled with water and wheeled from the water source to where the water is needed. Simple. And in its simplicity it has two other huge benefits. First, it eliminates the physical strain and the risk of serious injury for the water carrier from carrying a jug or pot filled with water on the head, day after day, year after year – as tradition dictates. Secondly, it carries 45litres of water at a time, that’s four times more than a traditional pot or jug. This translates to the water carrier also gaining the gift of time. Time to perform other tasks within his/her community, at work, in education or to follow another dream that would otherwise remain just that, a dream. 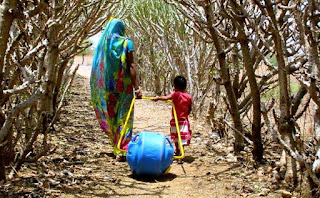 The waterwheel is a life changer for millions of people. And some traditions are meant to be broken. Right here and Right now. 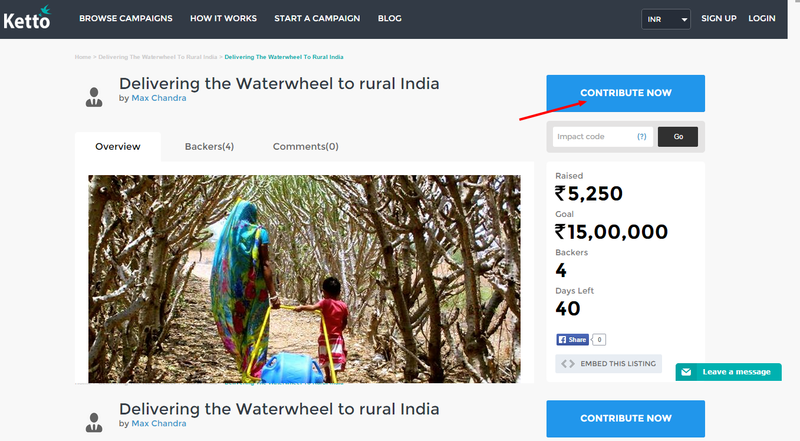 How to contribute to the cause? Go to this link Max Chandra Page. 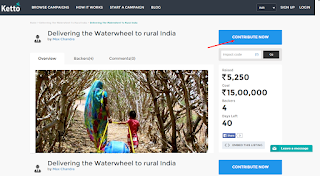 Click on Contribute now button, A window with the amount you wish to contribute will appear. 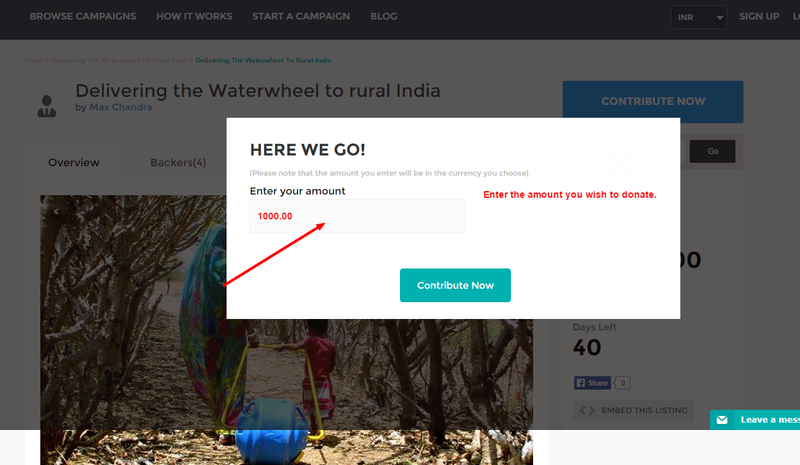 Click Contribute Now after entering the amount. You will be redirected to the payment page, enter the payment details and you are done. Please do share this cause of delivering water to thirsty rural Indians.